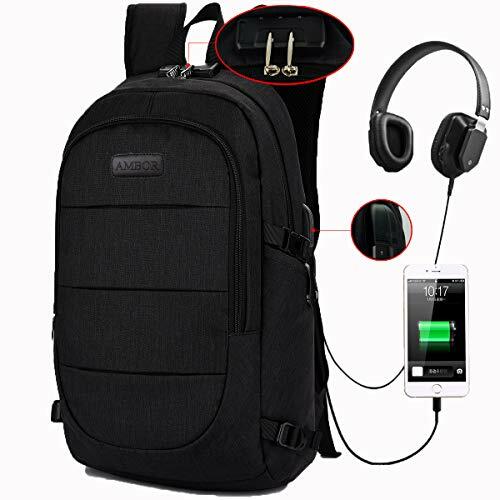 AMBOR Travel Laptop Backpack, Anti Theft Business Waterproof Laptop Backpack with USB Charging Port and Headphone Interface fits Under 15.6" Laptop, for College Student Work Men & Women.Black | Replicafer Co.
About AMBOR Innovation is the main concept of our brand. We are committed to providing our consumer with high quality and cost-effective products, which aims to make the consumers really feel the charm of the product itself. Make from High Density and Water Resistant Oxford cloth and come with a High Quality Combination Lock, protect your valuable items inside from thief and provide more benefits for your office or school life. USB Charging Port &Headphone Compartment；With a humanized USB charging interface design, it is great to enjoy theconvenient charging by connected with the portable charger and your electronic device, easily keep your smartphone full power anytime and anywhere. Internal structure: computer sidekicks, mobile phone bags, document bags, zipper bag,patch pocket and pen bag. Stitching design, multi - functional& modern stylish. Adjustable Straps, Audio Pocket, Bottle Pocket, Key Clip, Laptop Sleeve/Protection, Water Resistant. Breathable diversion design, the internal texture of fine, perspiration breathable, to achieve comfortable cooling effect. With a classic look that never goes out of style, durable construction, and details for all-day carrying comfort, this minimalistic backpack is a must have for the daily commute to school or occasional casual travel. Lightweight design is easy for carrying: The top grab handle offers quick grab-and-go style. Ergonomic design ensures the dispersion of gravity of the fulled bag. What You Get: 1x Backpack， 1x Combination Lock，1x USB CABLE，our 30-Day Money Back Guarantee worry-free 12-month warranty and friendly customer service. If you have any questions about this product by AMBOR, contact us by completing and submitting the form below. If you are looking for a specif part number, please include it with your message.